TICO supply into almost every industry imaginable including O&G, Petrochemical, Metallurgical, Engineering, Construction, HVAC…..and more. Tiflex are a UK company that operates in 3 main markets worldwide; Rail, Flooring and Industrial. All the products in these ranges are based on rubber and/or cork elastomer technology. The industrial range of products which includes pipe grips and impact / anti-vibration materials is called TICO. They have been in business since the 1940’s. TICO are specified on a huge number of projects and are a regular supplier to companies such as BP, Shell, Exxon Mobil, Chevron and others. TICO are also FPAL registered and have ISO 9001 accreditation and are also working towards 14001 and 18001. Our TICO range of products were designed originally for the North Sea oil platforms and these harsh environments require only high-quality products. TICO has an on-site laboratory, R&D department, and fully trained Quality Assurance personnel who ensure that every product that is produced maintains the high standards they set themselves and are naturally proud of. TICO supply into almost every industry imaginable including O&G, Petrochemical, Metallurgical, Engineering, Construction, HVAC…..and more. 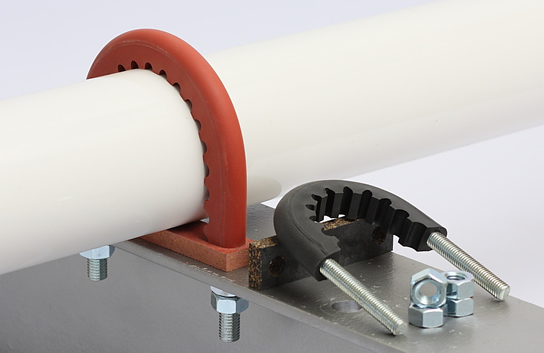 There isn’t any industry that doesn’t require pipe supports or anti-vibration solution at one time or another. Please contact us for a brochure.